Excel v5.0 PowerPak Utilities. Includes 17 helpful utilities. Thanks for your interest in the Power Utility Pak. Please read through this document before you install the product. The Power Utility Pak is an add-in that significantly improves Microsoft Excel 5.0 for Windows. It includes 17 new utilities, 17 new worksheet functions, and provides enhanced shortcut menus. In addition, it adds a new Utilities menu and a custom toolbar. The best way to become familiar with the Power Utility Pak is to install it and play around with it. You'll find that the new utilities and worksheet functions work exactly like the features built into Excel. 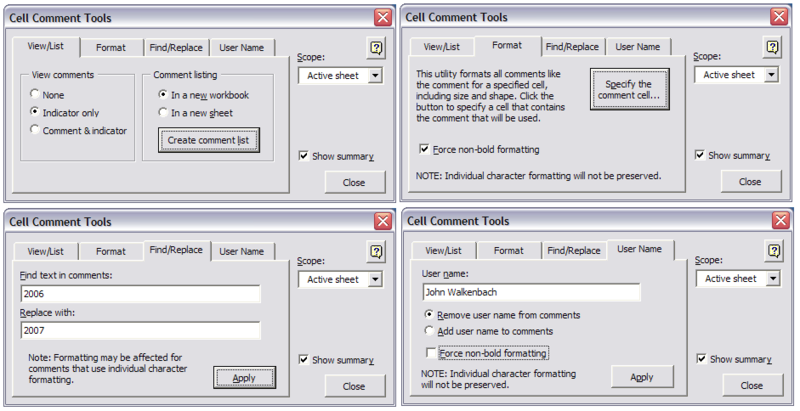 For example, the dialog box style is virtually identical to those used in Excel. The Power Utilit Pak custom toolbar displays tool tips and a brief explanation in the status bar. And you can even use the Function Wizard to insert any of the new worksheet functions (the new functions are in the Power Utility Pak function category). 1.Create a subdirectory* off of your EXCEL\LIBRARY directory, and name it POWER. 2.Copy all of the files except POWER.HLP to the EXCEL\LIBRARY\POWER directory. 3.Copy POWER.HLP to your EXCEL directory. 5.Choose the Tools Add-Ins command. 6.Click the Browse button, and select POWER.XLA in the EXCEL\LIBRARY\POWER directory. * Note: The Power Utility Pak can be installed in any directory, but we strongly suggest creating an EXCEL\LIBRARY\POWER directory and installing it there. Once POWER.XLA is installed using the Tools Add-Ins command, it will be loaded automatically whenever you start Excel. To completely remove the Power Utility Pak, select the Tools Add-Ins command and uncheck Power Utility Pak. If you quit Excel with Power Utility Pak unchecked, it will not load automatically. The shareware version of the Power Utility Pak is fully functional and is not crippled in any way. But true to the shareware tradition, you will see periodic nag messages when you access the utilities. Also, the HLP file included with the shareware version is seriously deficient in terms of the amount of information it contains. It's basically the help file for the registered version, but with all of the good stuff removed. You may use the shareware version for up to 30 days. After 30 days, you must either register it or delete it from your hard drive. 1.The latest version. This product is continually being fine-tuned and revised, so registering ensures that you have the latest version. 2.A slick installation program. This program, written in Excel VBA, will install the new files directly from Excel, with no effort on your part. 3.Comprehensive on-line help. You can get instant (context-sensitive) assistance for any of the utilities, worksheet functions, or enhanced shortcut menus. It also includes lots of tips on how to get the most from this product. 4.A free copy of the Power Game Pak for Excel. This is a collection of professional quality strategy games that you can play in Excel. The games are Video Poker, Triple Yahtzee, and Bomb Hunt (a Minesweeper clone). These are standard XLS files, so you can examine the VBA macros to see how they work. You probably never thought Excel could do this kind of stuff. 5.Free technical support. The Power Utility Pak developer will answer your questions about this product using the e-mail system of your choice (Internet, MCI Mail, CompuServe, or America On-Line). He's also open to suggestions for improvements, and has been known to take on consulting jobs. 6.The opportunity to purchase the complete source code. Registered users can purchase the original XLS files for the Power Utility Pak for an additional $20. If you want to learn VBA programming, you'll find a wealth of information and useful techniques that cannot be found anywhere else. This is much cheapter than a VBA book, and you'll probably learn more by studying actual code. For complete registration information, open the REGISTER.XLS workbook. You can register by phone (with a credit card) or by mail (with a check or money order). For fastest service, use any major credit card and register by calling the Public (software) Library at 1-800-242-4775. THIS NUMBER IS FOR ORDERS ONLY. THEY CANNOT ANSWER ANY QUESTIONS ABOUT THE SOFTWARE. Sorry, but I'm not in a position to take phone calls at this time. I think you'll enjoy this product, and I hope you decide to register it. Please feel free to distribute the shareware version to your friends and associates, and upload the original XLPOWR10.ZIP file to any bulletin boards or on-line services you may use.